Pre – emergent crabgrass control gives season long control of crabgrass along with early post emergent control. Perma Green is proud to use Dimension pre-emergent herbicide and Lesco Pre M.
Broadleef weed control is included with each application of fertilizer, making your lawn virtually weed free. A controlled release nitrogen fertilizer that gives your lawn a continuous feeding throughout the season. Potash fertilizer for turf disease resistance and for improved winter hardiness. 0% phosphate fertilizer is used around lakes and ponds. PermaGreen Lawncare uses Lesco controlled release nitrogen fertilizer that gives your lawn a continuous feeding through out the season. Lesco fertilizer is a brand of fertilizers and lawn care products that provide the highest quality ingredients in a slow release from to provide better nutrition for lawns. 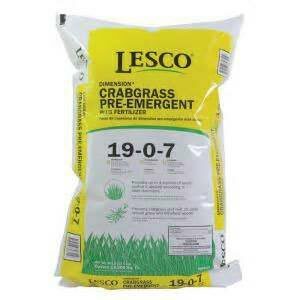 A beautiful and healthy lawn for your home or business begins with applying the right type of Lesco fertilizer. Starting in early spring and using regular applications throughout the summer and fall assures that your lawn will stay a lush vibrant green, will remain weed free and develop a deep healthy root system from which to take in the nutrients it needs to maintain its beauty. Most lawn fertilizers are developed to promote quick greening of your lawn. They are loaded with nitrogen which also promotes rapid lawn growth. Your lawn feasts on the quick release of nutrients within the fertilizer and then goes into a state of famine where there are virtually no nutrients left in the ground fertilizer to be released to help continuously feed your lawn. Lesco fertilizers take a different approach to feeding your lawn and keeping it healthy. Lesco fertilizers have been developed to release the nutrients within over a period of time and to constantly provide a source of energy to your lawn. Using this slow and continuous release, your lawn is constantly supplied with what it needs to maintain its good health and to provide you with a lawn of beauty. Your lawn will never go through the cycles of feast or famine when you apply professional grade Lesco fertilizer to your lawn. We also offer a Organic based fertilizer. Our specialty blend is equally safe for pets and the environment as our synthetic fertilizer. It also gives a deep green look and is a great root builder. 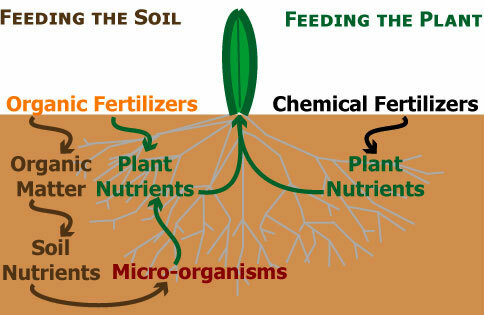 Unlike synthetic fertilizers, organic fertilizer feeds the soil. Your soil is a tiny ecosystem that depends on minerals and microbes for maximum health. Organic fertilizer adds minerals to the soil and encourages microbial growth, without burning the plants or leeching into groundwater. 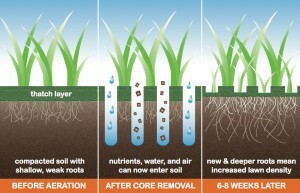 Advantage for lawns it improves soil structure. 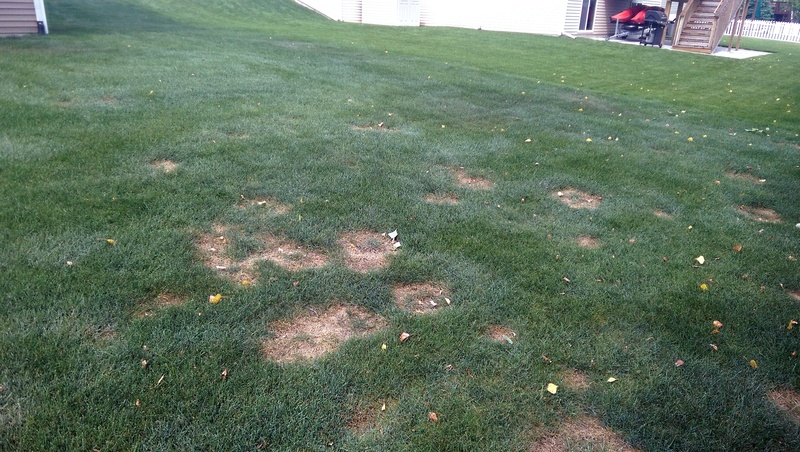 Helps in recovery of certain lawn diseases along with aeration such as necrotic ring. If you have sandy soil, you can increase its water- and nutrient-holding capacities by adding organic matter. If you have heavy clay soil, adding organic matter will make it more workable. 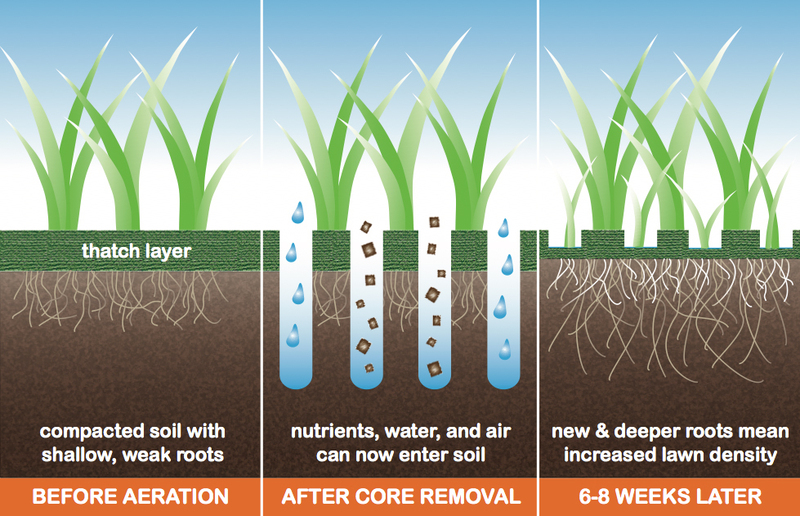 Reduces compaction and thatch, allowing your grass to grow deeper roots and make better use of water and fertilizer. Generally done in September or October. For additional information regarding aeration, please see MSU’s Turf Tip on the Cultivation of Lawns. Seeding can be done along with aeration for bare or thinner lawn areas. The plug cores create a good seed bed for grass to germinate. Merit insecticide applied in June or July for year long control of grubs is effective at extremely low use rates, controlling 75% to 100% from feeding on turf roots and reducing one of the food sources for moles, it does not control moles. 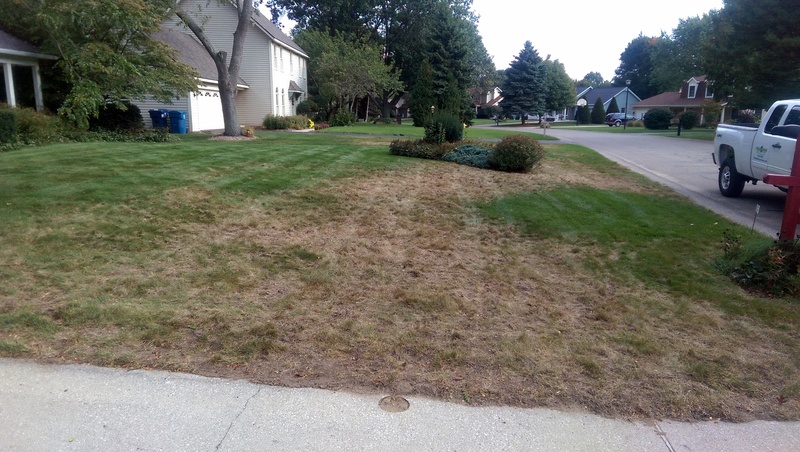 In the fall is when you notice most grub damage or the digging of skunks or raccoons searching for grubs tearing up sections of the lawn, at that time a different insecticide for grubs needs to be used such as Dylox, Sevin or Meridian. MSU’s Turf Tips also point to the use of Merit Insecticide as a great way to protect your lawn against grub damage. Talpirid is a bait that looks and smells like a worm – a major food source for moles. 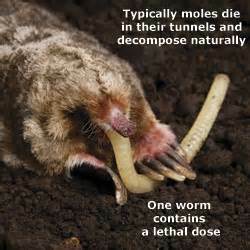 When correctly placed in tunnels, moles will eat the bait and die. Multiple treatments may need to be done as there is usually more than one mole or another mole will take over an existing mole run. Property surrounded by woods may have a constant invasion of moles. Building a below ground Donald Trump wall will keep them out. Castrol oil or Mole scram may detour them for a short time but they will be back. Grub control does not control moles it may reduce their activity but they feed on many insects which is primarily earthworms, that’s why we use the Talpirid bait, it is safe for pets if they do not dig into the mole tunnels. Traps do work well if they placed correctly in an active mole run. They have to be monitored weekly reset or placed in another active tunnel. Applying a combination of Pre-Emergent and Post-Emergent weed control materials in your landscape beds can drastically reduce the need for hand-pulling of weeds, up to 70% in most situations. Having these services performed throughout the year will help maintain a beautiful property. Whether you’re trying to improve or maintain the image of your commercial property or your home, managing weeds in your landscaping beds is an important element of landscape maintenance. Hand-pulling of weeds can take a lot of your time or incur labor cost to have a landscaping company perform this service for you. However, there are alternatives to reduce cost and labor and keep your shrub beds looking beautiful. Pre-Emergent Weed Control: These granular and liquid treatments are performed a few times throughout the year to reduce seed germination of weeds in your mulched beds. Preventing and reducing the emergence of weeds in your beds can keep your landscape from getting out of control. Post-Emergent Weed Control: Spot-spraying your landscape beds throughout the year will help to control most weeds present at the time of treatment. The more frequent these visits are, the smaller the weeds will be, thus easier to control. This can eliminate the need to hand-pull weeds in many areas except in ground cover and annual flower beds. 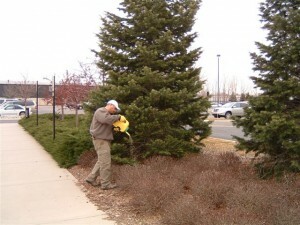 Safe for Trees & Shrubs: The materials we use will not harm your trees, shrubs. In some situations were weeds are growing through groundcover plants may not be able to be treated as well as areas with tender annuals planted in them may not be able to be treated with post-emergent materials. Insects and disease problems may occur, but detection of the problem and a control strategy can be put in place. Insecticides or fungicides can help to correct the problem as well as cultural controls such as watering, mowing, aeration and fertility. A healthy plant is your best defense against disease and insects. Many trees and shrubs in the home landscape receive adequate nutrients from the soil, decomposing leaf and twig litter, or from lawn fertilizers routinely applied around them. Mature trees in a natural environment seldom require fertilizer due to their extensive root systems and symbiotic relationships with naturally occurring soil microorganisms. As long as a tree or shrub appears healthy and is growing at an acceptable rate there is no need to give it any additional fertilizer. Competing shrubs and trees in landscape beds often benefit from fertilization. Established plants that are putting on very little new growth each year or whose leaves are small and light in color will probably respond to nitrogen fertilizer. Older leaves that are purplish or yellow in color may indicate phosphorous deficiency, while areas of dead tissue along the leaf edges may be a symptom of potassium deficiency. 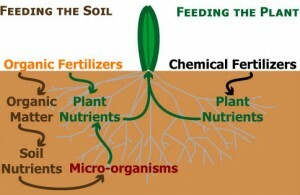 Nitrogen is the fertilizer nutrient that plants use in the largest amount; fertilizing with nitrogen causes plants to green up and increase growth rate. It is less likely that plants will respond to phosphorus or potassium fertilization. Soil tests will determine whether soil phosphorus and potassium levels are adequate. Unfortunately, there is no useful test for soil nitrogen. Deficiencies of minor nutrients such as iron, magnesium or manganese occur occasionally and can be diagnosed by symptoms and/or by leaf tissue analysis. Problems caused by planting too deep, over-watering, drought, disease or mechanical damage may cause symptoms similar to nutrient deficiencies. 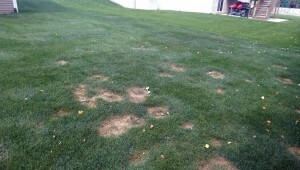 Fertilizer applications will not correct any of these problems. Apply fertilizer in early spring or in autumn after shoot growth ceases, as root growth and maximum nutrient uptake occurs during these periods. Plants take in few nutrients during periods of active shoot growth.